Powers/Abilities: The Goth possessed the superhuman ability to drain groups of people of their life energy, feeding off their essence until they either succumbed to his will or died. A scheming mastermind with proficient organizing skills, he set up and ran a global slave trade ring. 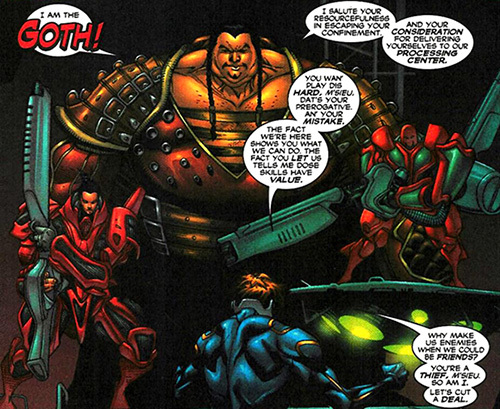 Though morbidly obese, the Goth was influential and strong enough to command the respect and loyalty of super powered groups such as the Crimson Pirates and his self-styled band of vigilantes. On occasion, the Goth asked his underling Sanguine to drain the life from his victims for him to feast on. It's not been revealed if he can survive on other sources of sustenance. (X-Men II#103 - BTS) - The Goth employed a band of super powered operatives he named after himself. The group consisted of Beldame who had the ability to turn her enemies' powers against themselves and drain a person's life essence, the mass teleporter Wanderer and their leader Sanguine who also had the ability to siphon life energy, enslaving his victims' minds in the process. Goth preferred the sanctity of his massive, underground city in China where he oversaw a global slave trade ring. (Uncanny X-Men I#385 (fb) - BTS) - Tullamore Voge, a slave dealer hailing from the dimension of Barsoom, ran a large slaver organization on Earth. He hired the Goth to help him collect humans and deal with the production and logistics. Goth brought in his other subordinates, the Crimson Pirates. (X-Men II#103 (fb) - BTS) - The Goth sent his crew to the town of Salem Center to gather humans for slave processing. They encountered a group of X-Men in a local bar called Harry's Hideaway and easily defeated them. Afterwards, they took Colossus, Archangel, Psylocke and Thunderbird hostage while kidnapping every other person in Salem Center as well. (Uncanny X-Men I#385 - BTS) - Wolverine used Cerebro to reach Phoenix's team in Moscow to inform them of the Goth capturing their teammates. Phoenix told Wolverine they were also dealing with a slavers organization at the moment, unaware Tullamore Voge was behind both operations. Phoenix's team was then attacked by the Crimson Pirates (also working for Voge). The Pirates captured all the X-Men, except for Phoenix and Beast. (X-Men II#104) - The captured X-Men managed to free themselves. Exploring the Goth's secret underground city in China, they discovered the Goth's slave processing center. Realizing he couldn't win against the slavers, Gambit proposed to cut a deal. Intrigued the Goth allowed the mutant to elaborate. (Uncanny X-Men I#385 (fb) - BTS) - Gambit offered the X-Men's services to the Goth, allegedly to prevent them from being given into slavery. In reality, Gambit hoped this tactic would allow them to get close enough to the Goth to take him out. (Uncanny X-Men I#385) - The Goth convened with Tullamore Voge and the Crimson Pirates in their secret underground city. When Gambit's team returned from the slave collecting mission they'd been sent on by Voge, the Goth and other slavers were surprised when they brought the remaining X-Men in as prisoners. Believing a celebration was in order, the Goth asked Sanguine for some refreshments. Sanguine still had Colossus under his control and was about to siphon off his life energy and transfer it to the Goth. Furious, Gambit reminded Goth of their deal, but Goth replied he was planning to sell him and the other X-Men as slaves anyway. However, the Goth had failed to take a small number of missing X-Men into consideration. By then, Beast, mentally linked with Forge, had shut down the slave collars the X-Men were wearing, allowing them to regain their powers and their senses. Reunited, both X-Men teams fought the Goth, his crew and the Crimson Pirates. The fight ended when the Goth began to drain the X-Men of their life energy. 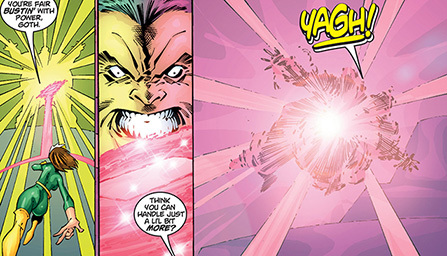 Rogue however absorbed Gambit's power and threw a supercharged card at Goth, killing him. (Uncanny X-Men I#385 (fb) - BTS) - The X-Men rounded up the villains, freed the slavers' captives and made arrangements to deliver everyone to the appropriate authorities or their homes. This effectively ended Voge's slaver organization on Earth. Tullamore Voge was also affiliated with several groups of the Neo (the Shockwave Riders and a group of Russian slave dealers led by Ransome Sole), it's well possible the Goth had connections to them as well.